The team of collaborators consisted of Nataša Ad&zcaron;i&cacute; and Christos Likos (University of Vienna), Clemens Jochum and Gerhard Kahl (TU Vienna), Emmanuel Stiakakis (Jülich) as well as Thomas Derrien and Dan Luo (Cornell). The researchers found a way to create dendrimers rigid enough to prevent back-folding of outer arms even in the case of high branching generations, preserving regular voids in their interior. 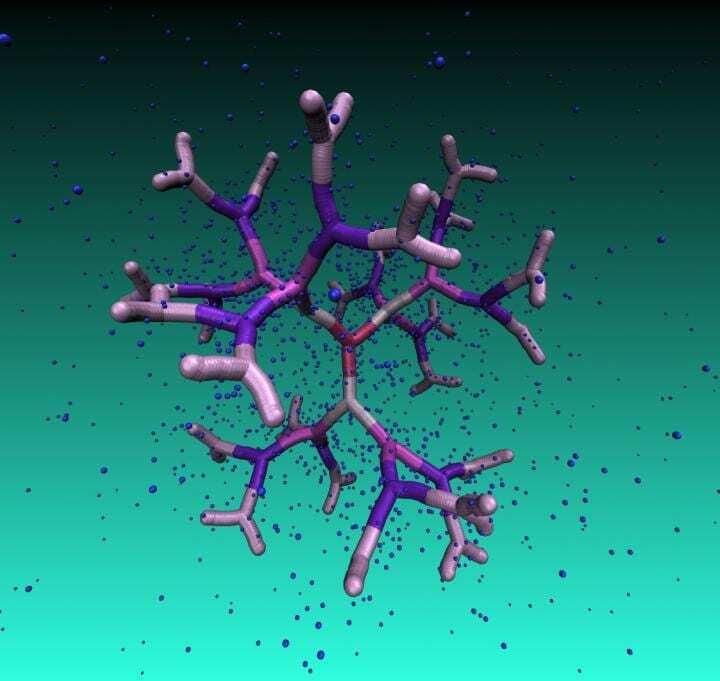 Moreover, their novel macromolecules are characterized by remarkable resistance to added salt: they showed that the morphology and conformational characteristics of these systems stay unaffected even upon of addition of salt even at high concentration. The nanocages they created, in the lab and studied computationally are DNA-based dendrimers, or so-called, dendrimer-like DNAs (DL-DNA). The building block they are composed of is a Y-shaped double-stranded DNA unit, a three-armed structure consisting of double-stranded DNA (ds-DNA), formed via hybridization of three single-stranded DNA chains (ss-DNA), each of which has partially complementary sequences to the other two. Each arm is made up of 13 base pairs and a single-stranded sticky end with four nucleobases which acts as a glue. While a single Y-DNA corresponds to the first dendrimer generation, the attachment of further Y-DNA elements yields DL-DNA of higher generations. The resulting dendrimer is a charged and hollow-containing macromolecular assembly with tree-like architecture. Due to the rigidity of dsDNA, the branches of DL-DNA are stiff so that the whole molecule is rigid. Since DNA is charged, the electrostatic repulsion enhances the rigidity of the molecule. DL-DNA molecules have been assembled in the laboratory by the Jülich and Cornell partners with remarkable control and sub-nanometer precision through programmable sticky-end cohesions. Their step-wise growth is highly controllable, unidirectional and non-reversible. This property is of high importance, as it has been shown that DNA-based dendrimers have been envisioned to play a promising role in developing nanoscale-barcodes, DNA-based vaccine technologies, as well as a structural probes involving multiplexed molecular sensing processes. Sizes, shapes as well as additional conformational details invisible to the experimentalists, such as the size of voids and the degree of branches back-folding, have been analyzed by computer simulations in Vienna. To describe the complex structure of DNA units, the group used a simple monomer-resolved model with interactions carefully chosen to mimic the equilibrium properties of DNA in physiological solution. The excellent agreement obtained between experiments and simulations for the dendrimer characteristics validates the theoretical models employed and paves the way for further investigation of the nanocages' properties and their applications as functional and smart nanocarriers and as building blocks for engineering biocompatible artificial materials. Clemens Jochum, Nataša Ad&zcaron;i&cacute;, Emmanuel Stiakakis, Thomas L. Derrien, Dan Luo, Gerhard Kahl, and Christos N. Likos: Structure and stimuli-responsiveness of all-DNA dendrimers: theory and experiment, Nanoscale (2018).